The 7 Best Fly Fishing Spots in Utah! In Utah, fly fishing is a way of life. This makes sense with how many fly fishing options exist in Utah. With river upon river, reservoir upon reservoir, and mountains upon mountains, Utahans embrace the state’s natural beauty when fly fishing with family and friends. 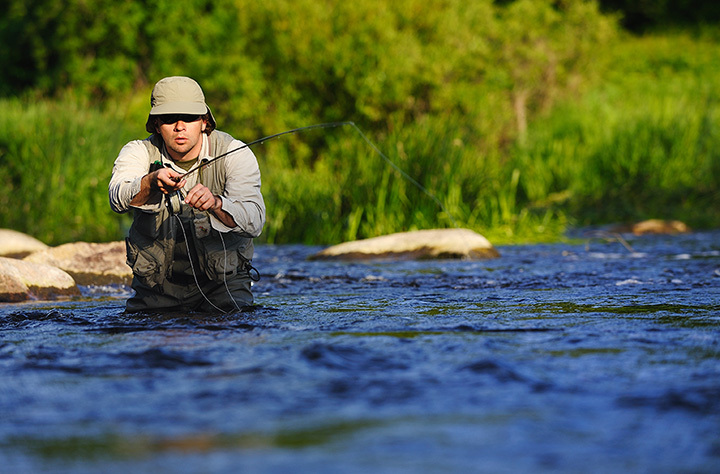 Here are the best spots for fly fishing in the state. Fly fishing can’t be all that great in the desert, right? Wrong. Boulder Mountain near Escalante National Forest is a stunning example of red rock fly fishing at its finest. There, you can fish for various types of trout and even the elusive trophy-sized trout. Hiring a professional guide is a sure-fire way to bring in some large fish. Strawberry Reservoir is one of Utah’s most popular fly fishing destinations. Here, your chances of catching fish are high. The largest fish ever caught here? A large cutthroat trout that weighed in at 27 pounds. With its convenient location, beautiful views, and consistently strong fishing action, Strawberry Reservoir is a guaranteed good time. With similar scenery as Strawberry Reservoir, Deer Creek Reservoir attracts all sorts of water lovers and fly fishers. Located at the top of Provo Canyon, the reservoir is giant (3,000 acres), meaning fly fishers can explore the area over and over again without getting bored. What’s more, family and friends who aren’t interested in fly fishing can enjoy the reservoir’s publicly owned shores and other water activities. Mirror Lake is a moderately sized, natural lake in the High Uinta Mountains. Due to its location, the lake usually proves more secluded and relaxing than more popular reservoir fly fishing locations. The lake is directly adjacent to a campground, so that if you’re interested in spending a few days fly fishing, you can camp nearby. Here, brook trout and rainbow trout rain supreme. Logan River has a reputation as one of the best trout streams in the intermountain region and is considered one of the best for fly fishing. That said, make sure not to go from late May through most of June because there is too high of a snowmelt run-off. The most prime time to fish here is from mid-July until early fall, which is also one of the prettiest times of year. Gooseberry Reservoir is a lesser-known body of water for fly fishers, but that’s one of its appeals. A smaller reservoir in a less-populated area of Utah, the reservoir is great for beginners who aren’t as interested in reservoirs up north. Located below Flaming Gorge Dam, Green River is a pristine stream that flows through a high-walled canyon. There are some fishing restrictions on the river, but fly fishing is allowed. This is a place you’ll come to again and again—a true fly fishing paradise. View more Utah Fishing Holes.